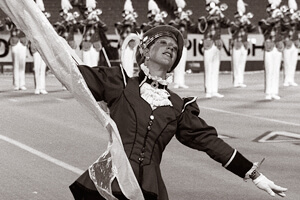 In 1989, both the DCI World Championships and Santa Clara Vanguard's "Phantom of the Opera" returned to Kansas City for the second year, with Vanguard earning its fifth DCI title after placing 2nd the previous four years in a row and earning a record high score for the time. 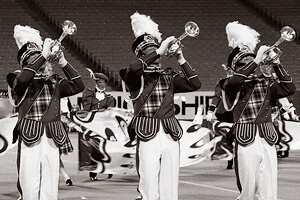 Madison Scouts, after winning the title in 1988, slipped to 7th place. Garfield Cadets changed their name to the Cadets of Bergen County and introduced a "strobe light" effect near the end of their "Les Miz" show, while Suncoast Sound performed a new "Florida Suite," taking a fresh view of their all-original music show from four years earlier. Crossmen popped back into Finals for the first time since 1984, after falling to 21st place in 1986, and Freelancers returned to the Top 12 for the first time since 1985. Bloomington, Indiana's Star of Indiana, in its fifth season, finished in the top six for the first time, moving up one position after sitting in 7th place the previous two years. The corps immersed itself in the pomp of British music, playing the music of William Walton and Gustav Holst. The color guard was divided into two groups, one as the less formal tartan-clad Highlanders, interpreting the longer arc of the lyrical moods, and the other the more prim and proper Redcoats, focused on the more concise, shorter segments of the musical lines. The two groups set up a visual counterpoint that helped the eyes "hear" the music. The production opened with William Walton's brash "Overture: The Globe Playhouse" from "Henry V." Walton wrote the music for a 1944 film produced near the end of World War II, directed by and staring Laurence Olivier. The film was partially paid for by the British government as a morale booster for the British people and based on the Shakespeare play of the same name. Brassy and regal, the music was visually accented by shields, coats of arms and other heraldry references in the guard. The power and articulateness of the brass was one of the highlights of the season. Gustav Holst's calming "Song Without Words" was conceived as mimicking the serenity of an English garden. Subtitled "I'll Love My Love," it was the second movement from Holst's "Second Suite in F for Military Band," largely based on folk tunes and published 11 years after it was written in 1911. Focused more on beauty than impact, the end of this relatively short segment, less than 90 seconds long, is where the corps' trademark star formation appeared in the drill. Holst's "Fantasia on the Dargason" is the final movement from "Second Suite in F" and was based on "Dargason," a 16th Century English dance. The "Dargason" part was introduced by the tubas and largely played by the percussion, accented by butterfly flags that appeared to flutter apart from any connecting pole. Discount DVD offer ends Monday, May 13 at 8:30 a.m. ET.